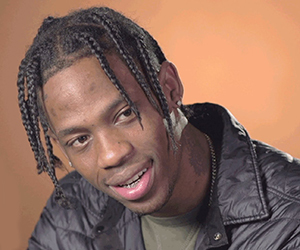 Jacques Bermon Webster II, using the stage name Travi$ Scott is an American trap performer and producer from Houston, Texas. Started with working with friends, in 2012 Scott enters into a double contract with recording companies Epic Records and GOOD Music. In the spring of 2013 publishes the debut mixtape Owl Pharaoh, and in the autumn of next year, Days Before Rodeo. Scott's Rodeo Tour has been acclaimed to be one of today's wildest rap tours. In autumn 2015, the artist’s debut studio album was released - Rodeo, who subsequently won the RIAA Platinum Certification. The album featured such artists as Kanye West, Justin Bieber, The Weeknd, Young Thug, Chief Keef and others. In the fall of 2016, Scott released his second studio album, Birds in the Trap Sing McKnight, which was well received by music critics. The album debuted at the top of the Billboard 200 chart, selling 53,000 digital copies in the first week of sales. The album includes guest couplets from artists like André 3000, Kendrick Lamar, Kid Cudi, Quavo and others.